My mom has this tattooed on her back. 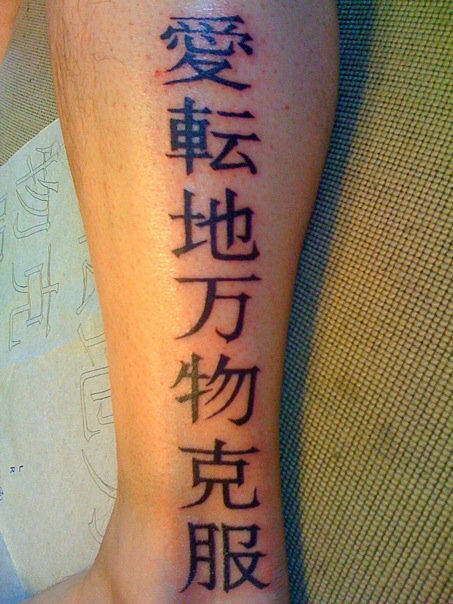 The guy that did it said that it meant Mom in Chinese. I have googled and googled and cannot find a meaning for this ... Can you help? Please. This is based on a different set of gibberish font we documented in 2009, where "m" is represented with 来 and "o" is 联. 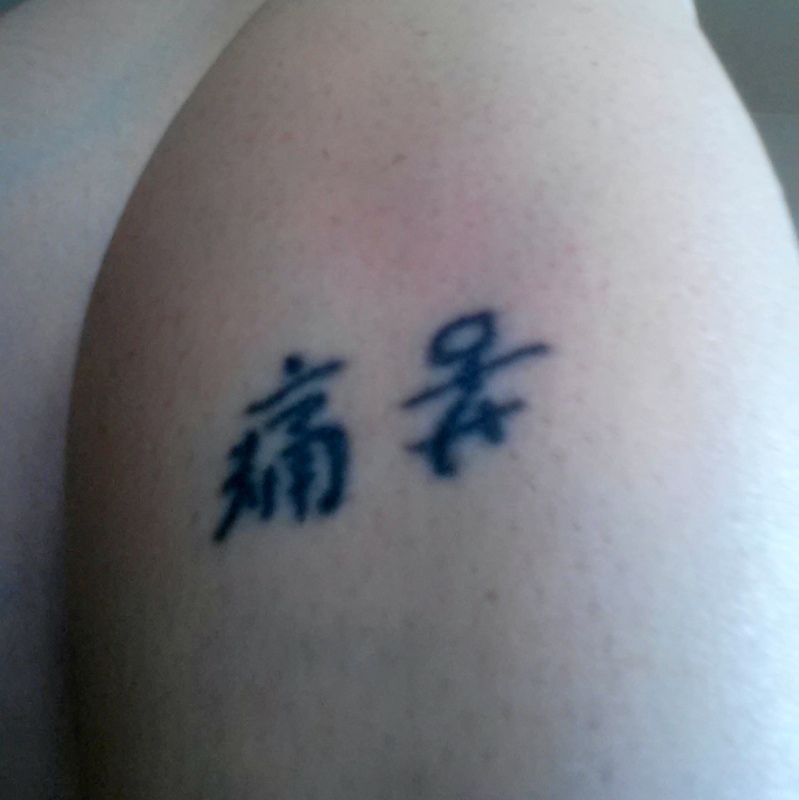 Here are two "Chinese" characters I have tattooed on my body. I got them when I was very young and wasn't legally allowed to even be tattooed. I was told they meant happiness and sadness. I am very embarrassed by getting these and now being older I'm very curious what they might mean if anything. 苦 of 痛苦 is upside down. Hello there. 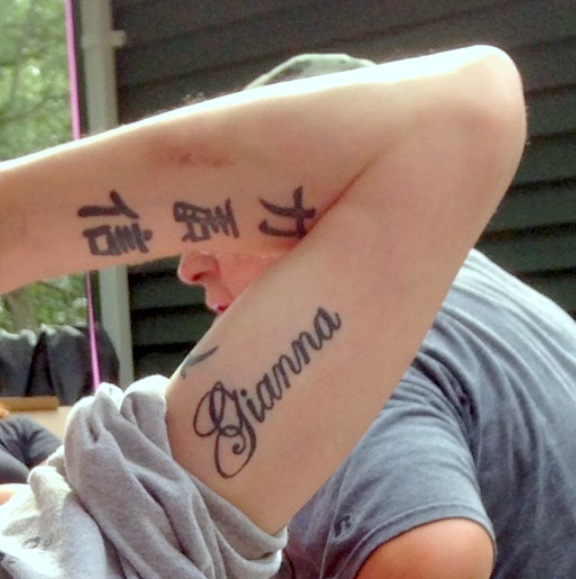 I just read your article- very entertaining :) I was wondering if you might find the time to translate a tattoo for me? My brother got one and I'm curious to know what it really means. 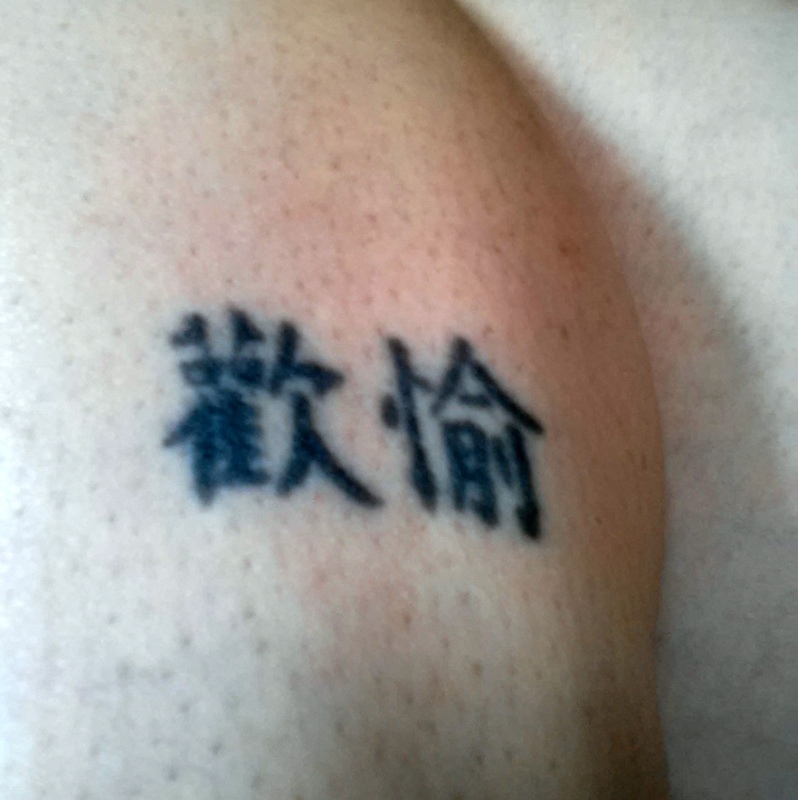 望 is revered referencing with other two characters, 力 and 信.
I've had this tattoo for almost 20 years, and I've had several friends get it as well. And I've met people who have had it as well before I ever knew them. We were all told it meant something akin to the Seize the Day sentiment. Were we right? Alan and I have already blogged about 生現 be complete gibberish back in 2007 and 2010, yet we continue to see people getting fooled to thinking it means "live for the day", "seize the day", "carpe diem", or "YOLO, you only live once". 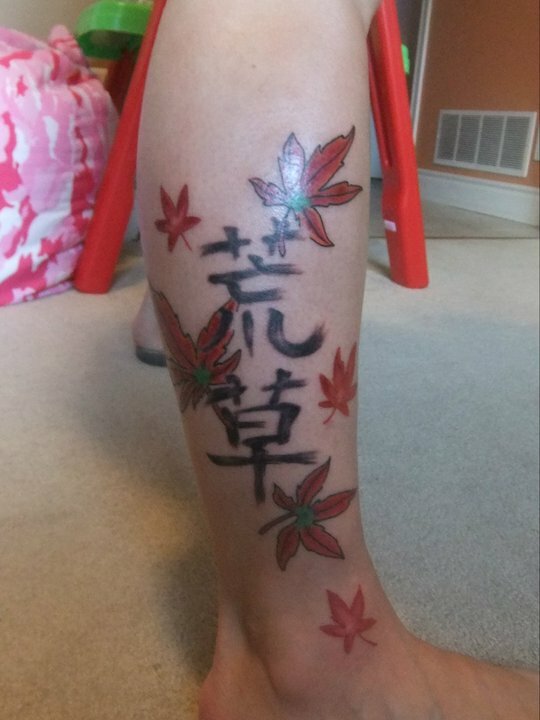 My girlfriend got this tattoo specially made. She even paid for a translator to get her daughters name. It’s supposed to say “ALEXA”. Can you tell me if it does or not? had a friend help out with the translation. he said afterwards it meant "property of mitsubishi" am i am car now? 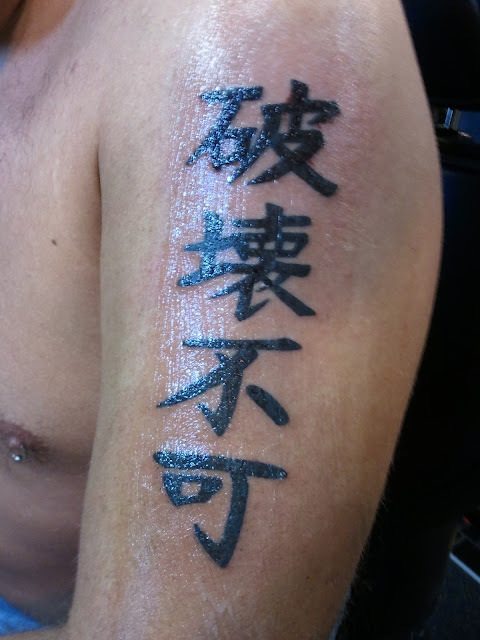 or does it say some variation on 'love conquers all' someone else who told me that the translation was incorrect. It is complete grammatical gibberish. "love / change [location] / ten thousand [many] things / overcome"
Obviously stupidity is one thing love can't conquer. I'm wondering what the left hand characters are? I was told it was 'new life' . Bernadette's attempt of humoring "chicken fried rice" has incorrect 飯, rice. 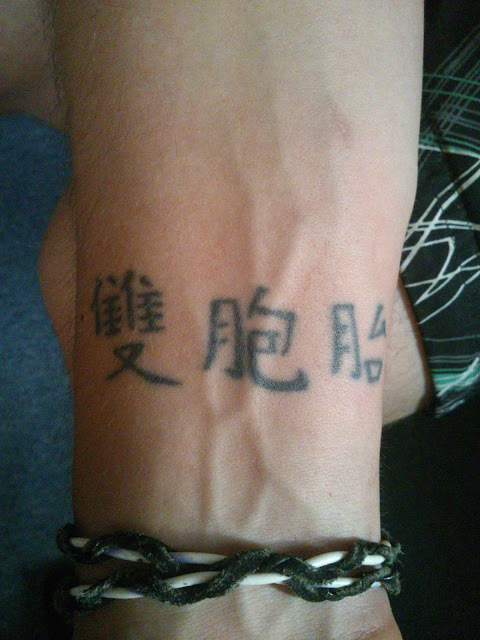 This Tatoo is from my Roommate. He got it 1 or 2 weeks after he went 18. Would you please Translate it? It should be the gemini zodiac sign ("Sternzeichen Zwilling" in german), i translated that with google, i hope you know what i mean with that. Astrology's Gemini is 雙子座, 雙胞胎 is biological twins. I was wondering if you could tell me what this means. It is complete gibberish and fooled by using this font. subject: Does this mean hakaifuka? I was told that hakaifuka means unbreakable. Do these symbols mean that? The characters are correct, however grammatically is reversed and contextually different than English's concept of "unbreakable". It is read as "damage / can not". Hello, just curious to know what the symbols used here actually mean. 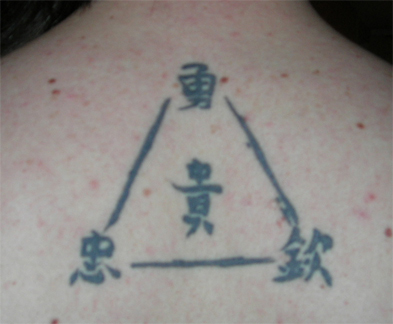 The impression I was left with is that the middle symbol is supposed to be honour and the three symbols around it courage, loyalty, and respect. I'm wondering if that is anywhere close to correct. Thanks! 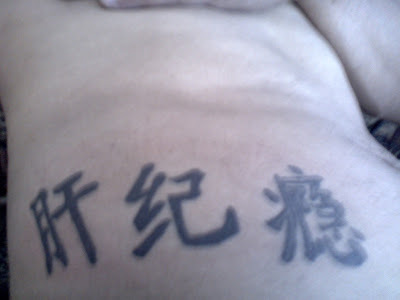 The center character, 貴, means "expensive, costly, valuable." 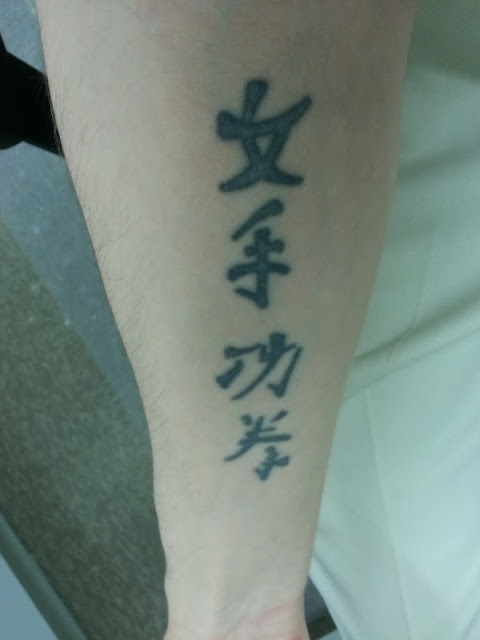 I got this tattoo about 15 years ago, I was told it meant wise/to excel, i'm kinda guessing that I wasn't too wise getting it as it probably means nothing of the sort!!! 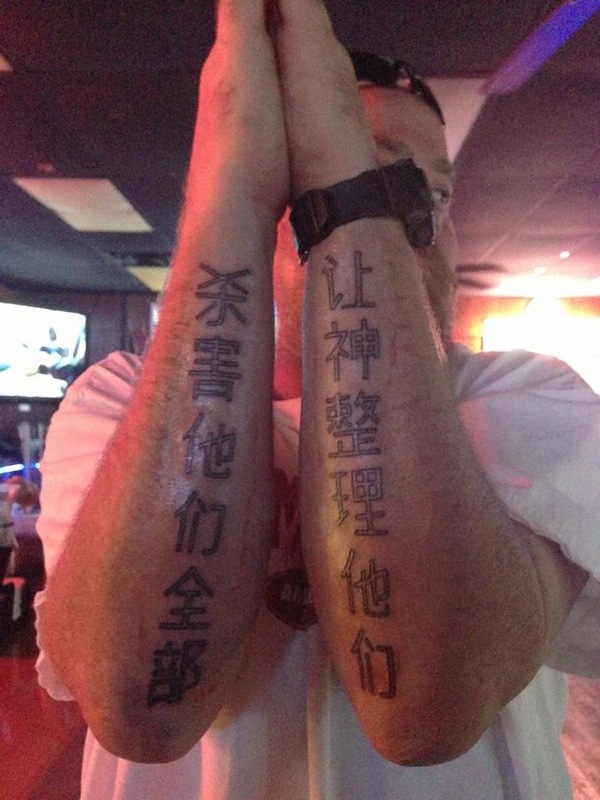 My friend just got this tattoo but he won't tell any of us what it means. I'm beginning to think it's just gibberish after seeing all of the older posts. Any help is appreciated! "Destroy / Them / Total"
"Let / Deity / Organize / Them"